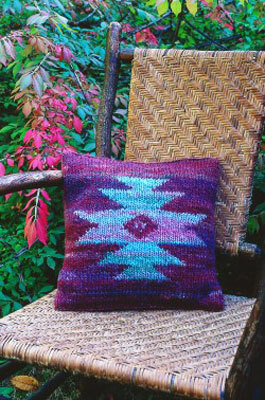 This knit intarsia pillow uses a simple Native American motif. When you make this intarsia pillow in hand-spun and plant-dyed yarn, the combination of pattern and yarn has the feel of a woven Navajo rug. You can substitute similar yarns in your favorite colors. With the MC, cast on 49 sts. Work in St st for 14 rows. Following the first row of this chart, knit 17 sts in the MC and 15 sts in the CC. With another ball of the MC, knit the remaining 17 sts. 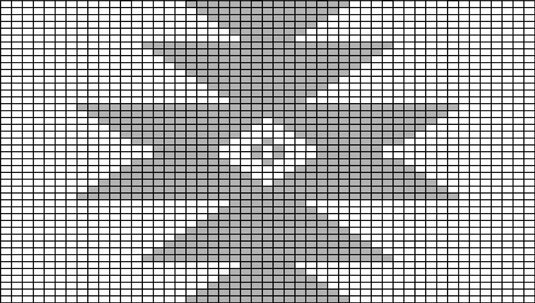 Work the center diamond shape in the MC as shown, but work the 6 CC sts in the center of the diamond (Rows 21, 22, 23, and 24) as duplicate stitch embroidery when you’ve finished and blocked your pillow piece. When you’ve worked through Row 44 of the chart, work 14 more rows with the MC in St st.
To make the pillow back, cast on (or pick up from edge) 49 sts. Work in St st until the piece measures 9 inches from the beginning and bind off. Work the second half of the pillow back in the same manner. Weave in loose ends and block the pieces gently with steam. If you’ve knitted the pieces separately, close the seam along the bottom edges by using the grafting technique or backstitch. Sew up the sides by using the mattress stitch. Insert the pillow form — and enjoy!